Though I typically post these on the first, I'm running February's roundup a day early to make room for the launch of the 2017 Survey of Paleoartists tomorrow. Come back tomorrow to read about, and take, the survey! Early in February, The Society of Vertebrate Paleontology spoke out against the Trump regime's hotly-debated immigration ban from nine majority-Muslim countries. Check out the full statement here. Isaberrysaurus mollensis is a newly described primitive neornithischian from the Early Jurassic Los Molles Formation. 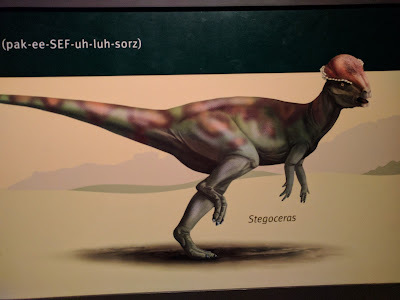 Discovered with a belly full of cycad seeds, it was initially thought to occupy a more basal spot in ornithischia on account of its rather stegosaurian noggin. Read more from Franz Anthony at Earth Archives. It barely missed the cut last month, so I'll include it this time. Saccorhytus coronarius is the newly discovered, 540 million year old contender for earliest deuterostome. As NPR's All Things Considered put it, S. coronarius was "basically a giant gaping mouth with spikes and some extra holes — probably for oozing waste." Sounds like I've got my Halloween costume figured out. Read more from Smithsonian, Phys Org, and CNN. At Laelaps, Brian Switek introduces us to Keilhauia nui, a Jurassic ichthyosaur discovered in Svalbard, Norway and notable among its kin for the fact that its hips were preserved with it. Now we just need to enlist Weird Al to parody Shakira to make this story blow up. Bulbasaurus phylloxyron illustration by Matt Celeskey, distributed with press materials for the PeerJ publication. Bulbasaurus phylloxyron is a new, gnarly-looking dicynodont from the Karoo basin of South Africa, described by Christian Kammerer in PeerJ. And there's a Pokémon connection, so it actually made the news! Read more from Everything Dinosaur, Shaena Montanari for Forbes, Jon Tennant for PloS Paleo Community, and Sarah Sloat for Inverse. Matt Celeskey's restoration, above, is a beauty. LITC's Asher Elbein has been a busy guy. First: his terrific piece for Audubon on how modern paleontology is harnessing the power of lasers to study fossils: in this case, research published in December on the early Cretaceous bird Confuciusornis, indicating it was capable of flight and adapted for arboreality. After that appetizer, dive into his new piece for the Bitter Southerner, in which he writes about the largely obscured history of the continent of Appalachia. 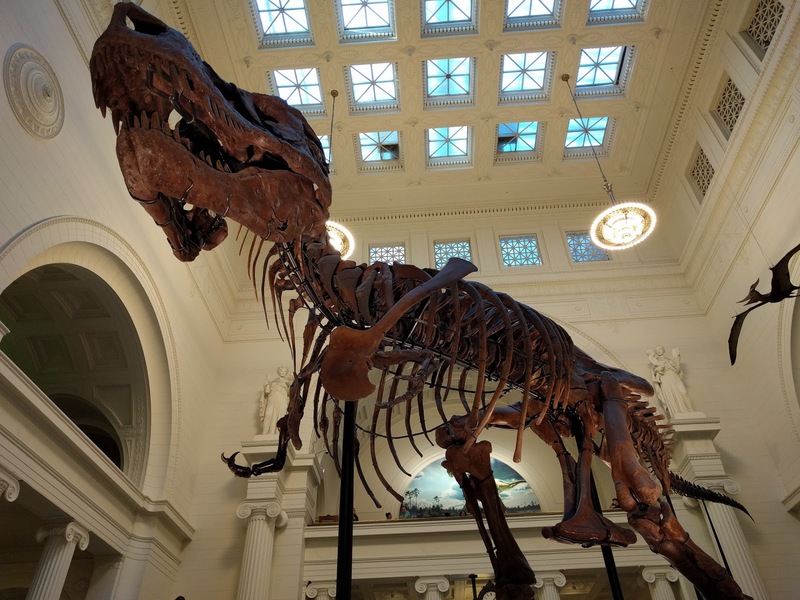 Though many of the Mesozoic fossils of the eastern US are scrappy, Asher writes, "...put enough scraps together, and you can catch a glimpse of something more: the shape of a body, the shape of a forest, the shape of a land lost beneath fathomless time." Popular Mechanics ran a brief article on the Paleobiology Database Navigator, a tool that allows users to explore fossil localities by geological timeframe, taxa, or location. It's pretty great, check it out if you haven't already. Thea Boodhoo tells the story of her involvement with the Institute for the Study of Mongolian Dinosaurs and lays out the background of the institute's mission to raise up a new generation of Mongolian paleontologists. Learn about the fossils of Big Bend National Park from the Mary Anning's Revenge crew. It's like... maybe public lands are super-important and worth preserving? Is that a crazy, fringe idea these days? Continuing the public lands theme, Robert Gay visits the PLoS Paleo Community blog to tell the story of Bears Ears National Monument's fossil treasures. I previously linked to a post on BENM in January, but it's too good a story to miss. 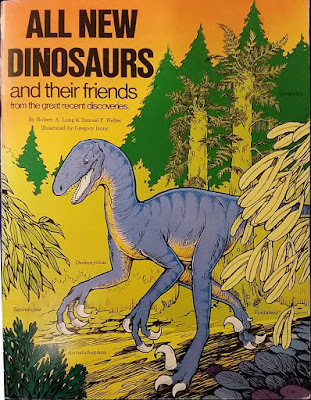 At Archosaur Musings, Dave Hone has launched a new series in which paleontologists discuss favorite or unsung scientific papers. He kicks it off with Mike Taylor, who writes about the process of publishing his paper with Matt Wedel on sauropod neck length. 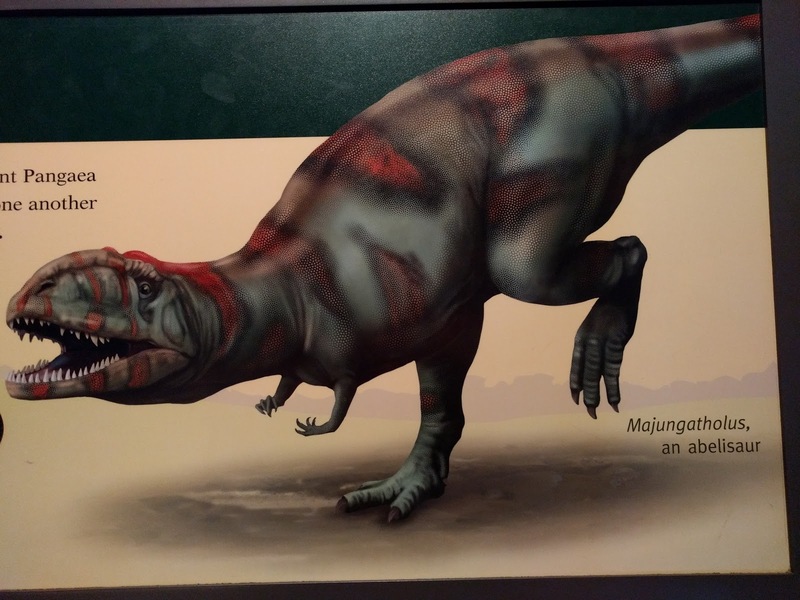 "Scientist-led palaeoart should be the best there is," says Mark Witton, "carefully-executed, evidence-led syntheses of research conclusions in compelling artworks." So it's incredibly frustrating when paleoart commissioned by a scientist and created under their guidance fails in fundamental ways. Read Mark's full commentary at his blog. There's a new paleontology-infused podcast in town: Common Descent. Darren Naish shares a write-up of his talk at last autumn's Popularising Palaeontology event at King's College London. Head to Tet Zoo to read about his talk on paleoart memes. You can check out more about the workshop, including videos of the talks, at the Popularising Palaeontology website. Jillian Noyes celebrates the enduring power of Disney's "Rite of Spring" segment of Fantasia at Extinct. Did you know about Peru's Talara tar pits? Brian Switek waxes rhapsodic about their beautiful, jet-black bounty, as well as discussing some other tar pit sites that don't get the attention La Brea receives. 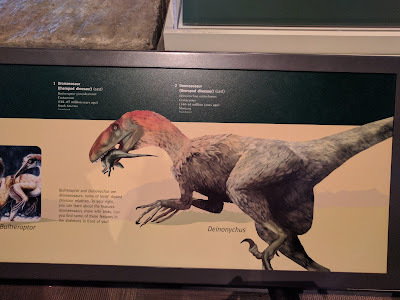 In another post championing an unsung fossil, he gives some overdue love to Torvosaurus' smaller cousin Marshosaurus, a mid-sized Morrison predator only known from some bits of jaw and hip. At Musings of a Clumsy Palaeontologist, Liz Martin-Silverstone is celebrating 150 years of Canadian paleontology, a rich history that kicked off with the discovery of a Dimetrodon on Prince Edward Island in 1845. Read her first post in the series here. Some juicy new books and art to pick up this month! I figure they're deserving of their very own section here. We'll see if there's enough every month to keep it around. Anthony Martin's new book was released on February 7. Pick up The Evolution Underground to learn about the natural history of burrowing animals. Also check out Tony's post on the book at his Life Traces of the Georgia Coast blog. If you haven't been to Chris DiPiazza's on-line store, do yourself a favor and check it out. 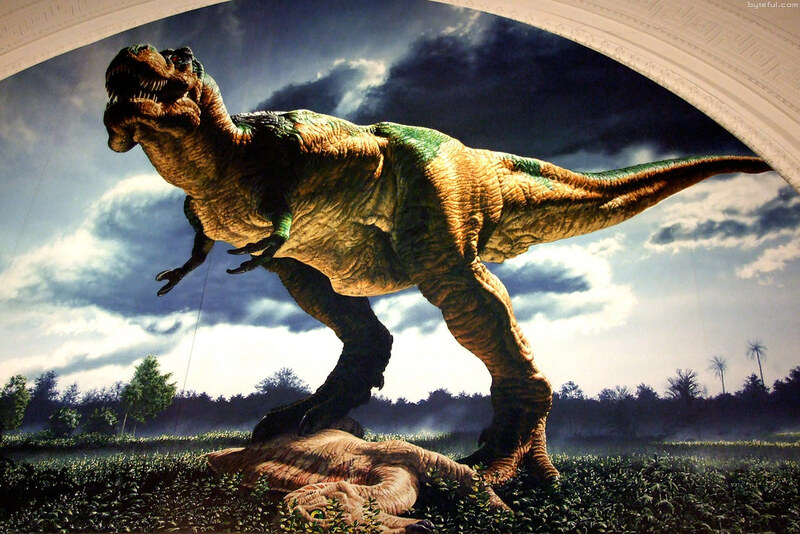 I am particularly enamored of his successful effort to counter the "tiny arms" slander T. rex is prone to receive. Some great stuff has been coming out from the 252MYA crew. Just a few recent pieces: Greer Strother's Hatzegopteryx poster. Franz Anthony's Ediacaran Biota tee. Julio Lacerda's Age of Fishes poster. I'll also note that 252MYA's licensing arm is now live, so there's literally no reason any media needs to resort to atrocious CG abominations instead of good paleoart. Brian Engh is selling his paleoart book to Patreon supporters who pledge at the $20 per month level or higher, and if you commit to keeping that pledge level for at least two months, he'll draw a custom illustration of your choosing on the inside cover! And while you're here, dim the lights and check out Brian's second video dedicated to the dinosaur trackmakers of Copper Ridge. He also touches on gnarly injuries, the vital role of predators, the importance of public lands. Details on his book promotion at the end of the video. It's not in the 252mya shop at the moment, but Gabriel Ugueto has added to his growing selection of Mesozoic fauna posters. Now available at Redbubble: Wessex dinosaurs and pterosaurs and one dedicated to the fauna of the Las Hoyas Formation of Spain. Dude's got a selfie next to the word "prolific" in the Merriam-Webster's. Sharon Wegner-Larson released another great fossil-based design this month: Triceratops Rocks. Minerals, ginkgo leaves, and one of the coolest skulls of all time, what's not to love? Emily Willoughby, Jonathan Kane, and Mike Keesey's new book God's Word or Human Reason? : An Inside Perspective on Creationism is now available. A limited number of signed hardcover copies are available from Emily for $40 through Paypal, too. The book, as you may guess from the subtitle, lays out evidence for evolution from a group of authors who were at one time creationists. Also, I had the distinct honor of designing the cover! A panel from page 11 of Paleocene © Mike Keesey. Shared here with the artist's permission. More from Mike Keesey, why not? I love his comic Paleocene. 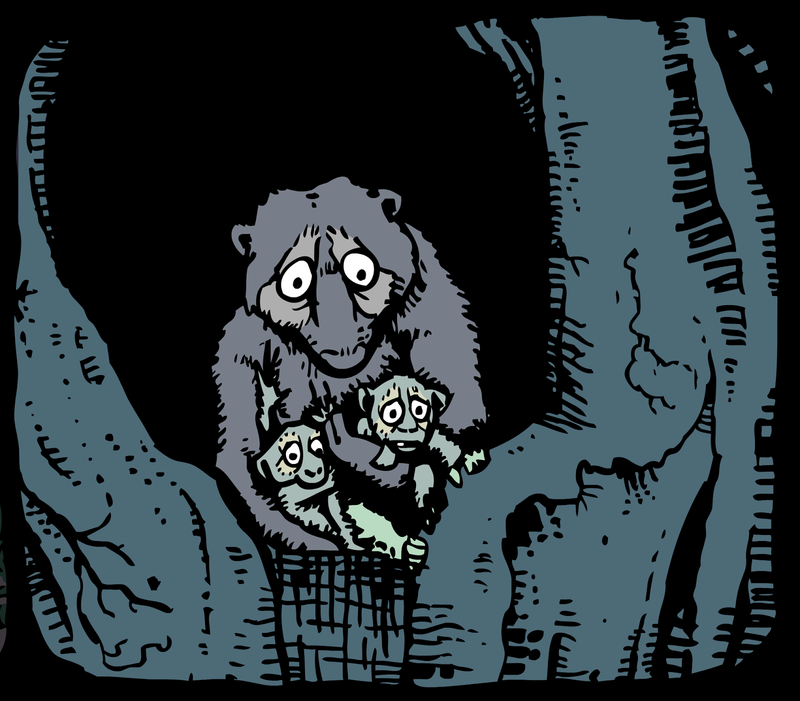 Set in the devastated post K-T world, the opening chapter of the comic (he completed page 20 recently) has set the stage for a story about a clan of stem-primates as they struggle for survival. It even involves issues of class. I love the writing, the color, the atmosphere... it's just great. To support him in this and other endeavors, sign on to be a patron at his Patreon page. 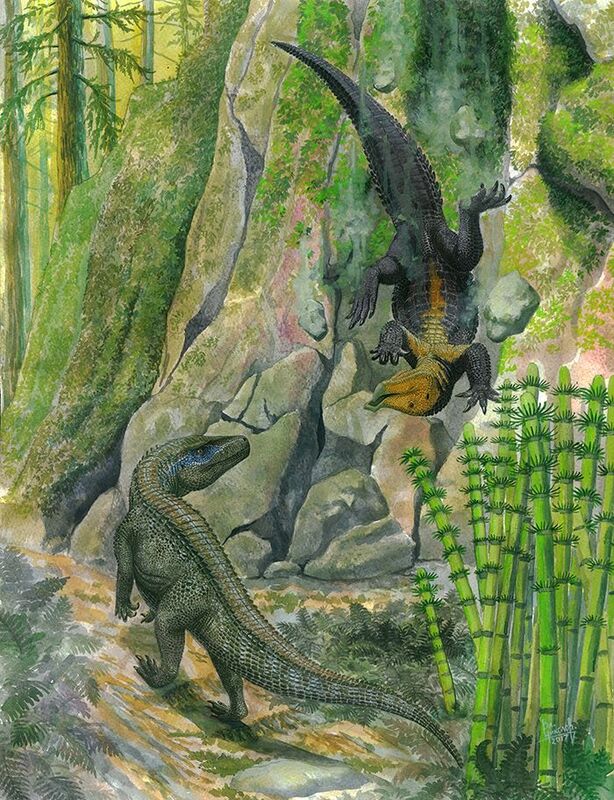 An unfortunate individual of the aetosaurian species Stagonolepis robertsoni is falling to its death, while a nearby passing Ornithosuchus woodwardi is suddenly offered a free lunch. In nature, in great many occasions, someone's loss and pain is someone else's gain. The scene takes place during the Late Triassic in what is now Scotland. The Last Fall © Vladimir Nikolov. Shared here with the artist's permission. You can check it out at DeviantArt and leave him a constructive comment, too. That's a wrap for February. As ever, your comments and shares on social media are greatly appreciated. 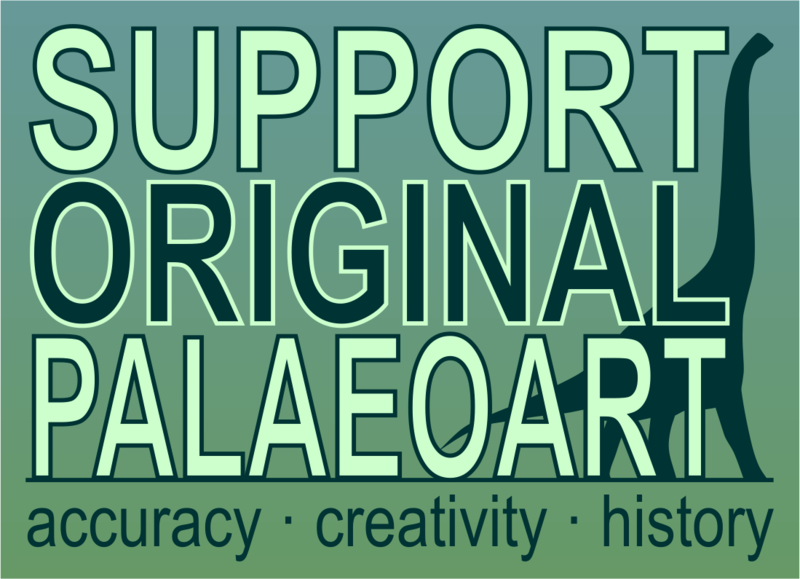 And seriously, come back tomorrow for the launch of the 2017 Survey of Paleoartists! A line of people snakes through the north entryway, populated mostly by locals taking advantage of a promotion offering free entry for state residents. From the middle of a group of twentysomethings, I hear a man's voice express mild disappointment as he peers past the ticket counters at the famous tyrant dinosaur beyond. "I thought she'd be bigger." "Just wait 'til you're below her," I respond. Queen Sue. Photo by David Orr. 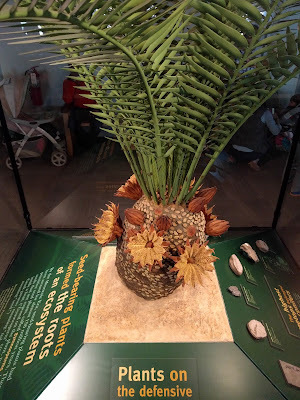 After attending the Wild Things conference this weekend, conversing with all sorts of people about conservation and urban ecology in the Midwest US, I grabbed the chance to visit the Field Museum. The Field is one of my favorite places to spend a day indoors. 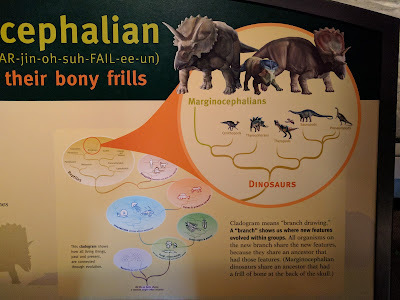 In a previous post, I did a walkthrough of the Field's dinosaur hall (with more photos here). I thought that this time, I might aim a more critical eye at the exhibit, especially concerning the role of paleoart. Due to the heavy weekend crowd, I didn't even try for exhaustive documentation, but I think I got enough to be worth sharing here, and I'll supplement with some of my older photos. 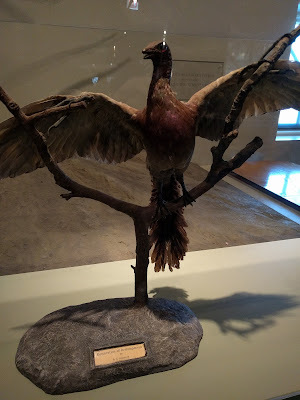 I'd also recommend Ben Miller's thoughtful walkthrough and review of the entire Evolving Planet exhibit at Extinct Monsters. 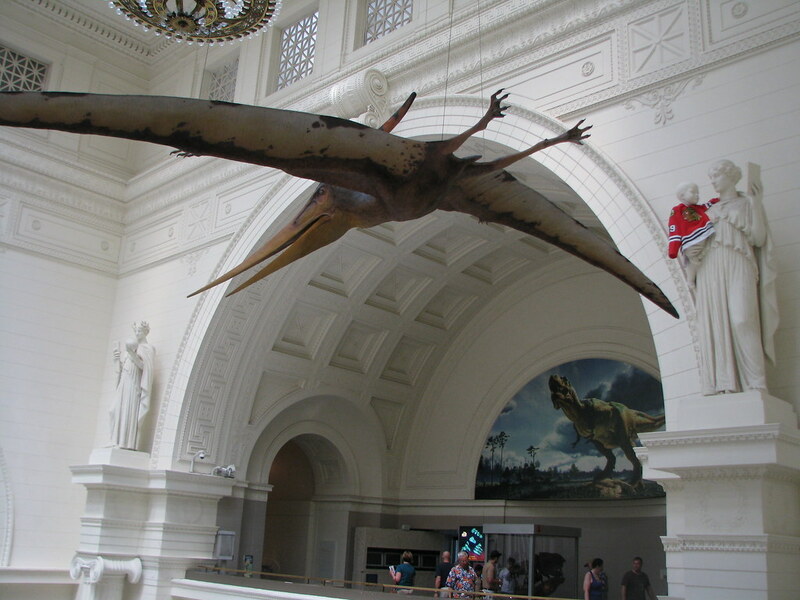 A Pteranodon model with the John Gurche "Sue" mural in the background. 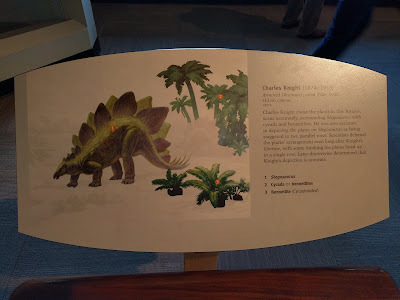 The most visible pieces of 2-D paleoart in the Field are the Charles R. Knight murals, mounted high around the perimeter of the dinosaur hall as well as select positions along the exhibit's length. They surely deserve prominent display (the first paleoart visitors encounter would be Gurche's Sue mural overlooking the queen herself). I would love to see more contemporary artists given more prominence. Perhaps a revisit of classic Knight scenarios and compositions, with information given about the evolution of ideas in the last century of paleontological study. Daspletosaurus mount with classic Knight Tyrannosaurus v. Triceratops in the background. 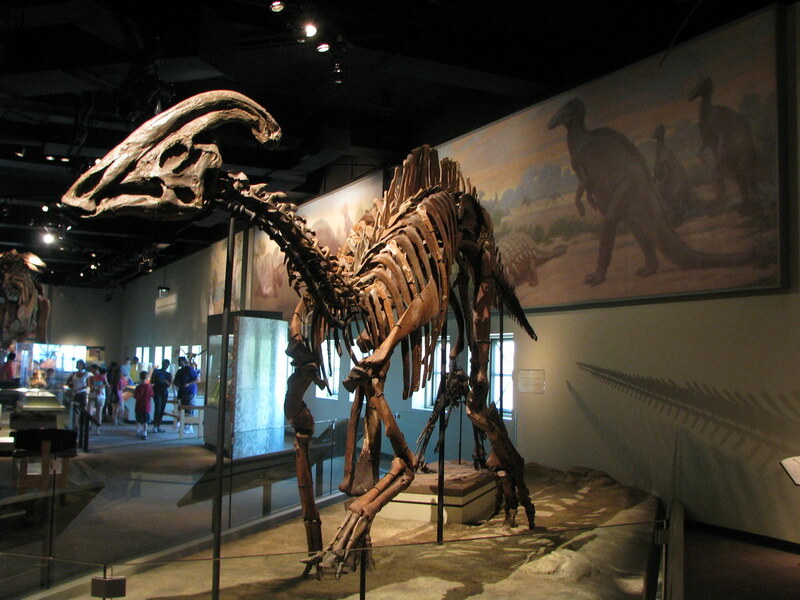 A mount of Parasaurolophus with retro Knight hadrosaurs in the background. 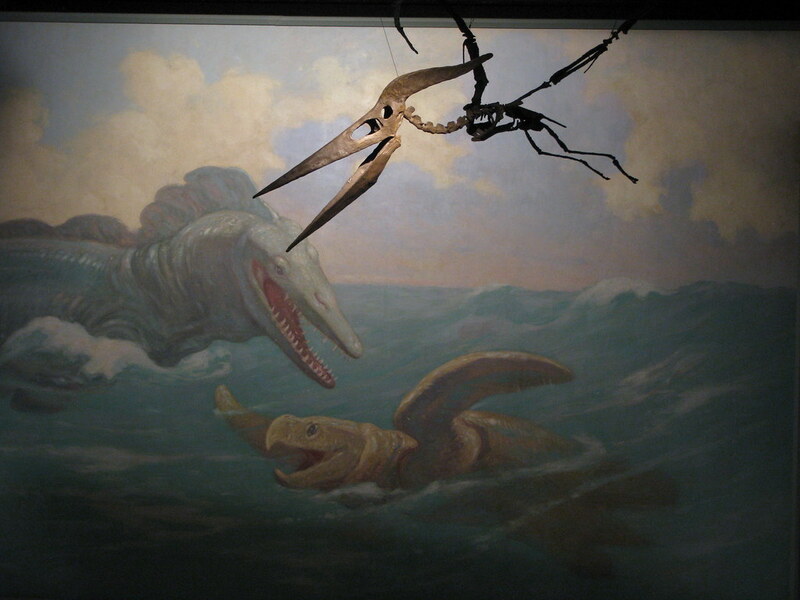 Pteranodon skeletal model with retro Tylosaurus and Archelon in the background. Is that sacrilege? Maybe it is, but for the collection's importance to the history of paleoart, these pieces arguably work at cross-purposes to the content of the exhibit. In Evolving Planet, aside from "how do we know this?" passages on informational panels intended to counter creationist prejudices visitors may bring with them, the story of the science isn't foregrounded. * So it's a bit counterproductive to have so much antiquated scientific illustration present, without equally prominent discussion of how the science has progressed. In a museum where space is at a premium, it may be a pipe dream, but it's a pipe dream I like. This is not to say that the art's vintage is entirely unremarked upon: for instance, Knight's place in the history of the science is called out in one of the informational panels, opposite the Stegosaurus mount. The exhibit isn't entirely devoid of newer art. 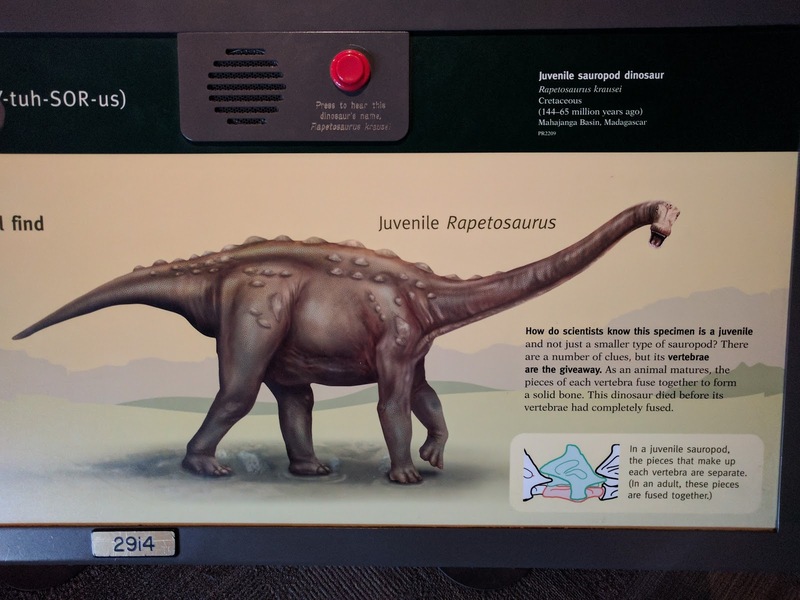 The didactic panels accompanying fossil mounts include serviceable, if sometimes shrink-wrappy, occasionally GSP-posed, illustrations of the animals. 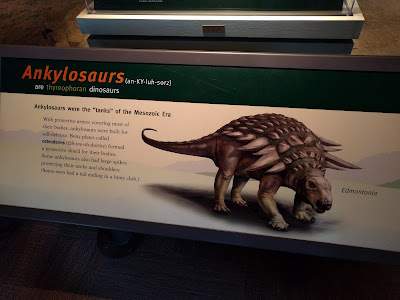 Illustration of Edmontonia, in a familiar pose. Illustration of a skinny-necked Rapetosaurus juvenile. There's no information on the artist. The style is sometimes too airbrushy, which doesn't do much for me personally. 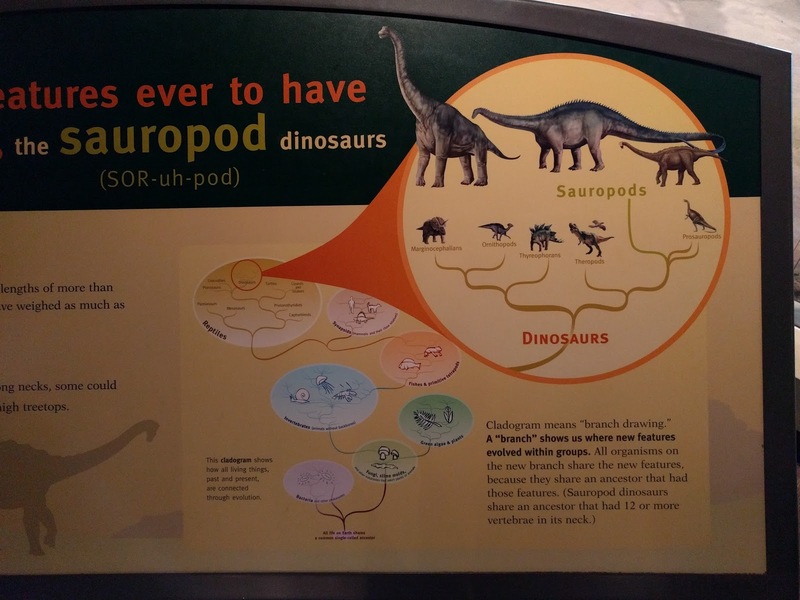 Some of the panels also include cladistic diagrams, which are helpful to ground the animals in their evolutionary context. There's even an explanation of what a cladogram is, and tough words like "Marginocephalians." Contrast this with a panel earlier in the exhibit, in which the Ediacaran biota is referred to simply as the "earliest animals." Such concision is understandable. But the amount of fine-grain information provided in the dinosaur hall implicitly confirms a visitor's idea that these animals are of the utmost importance. 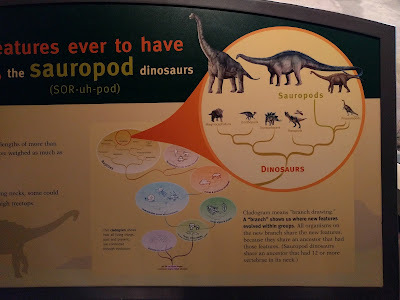 Sauropod cladogram, with a scrawny-necked Apatosaurus in the middle. Marginocephalian cladogram, featuring Triceratops. Protoceratops, and Anchiceratops illustrations. No pachycephalosaurs for you!. 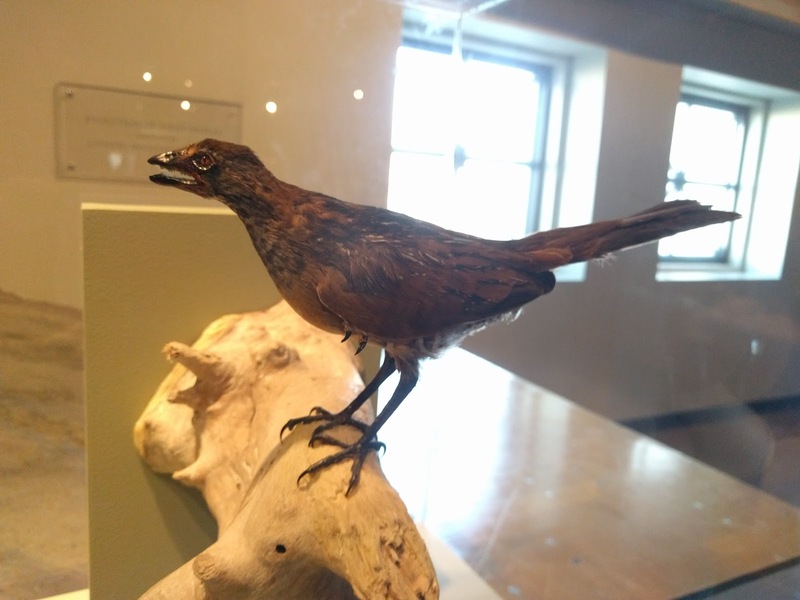 In the small pocket of the hall dedicated to the evolution of birds, casts of Archaeopteryx and Sinornis fossils are accompanied by fully feathered models, as well as illustrations of Deinonychus and Sinornithosaurus in the old-school, grudgingly feathered mode. 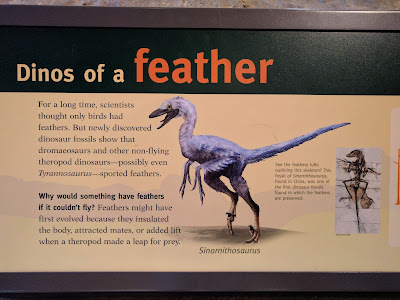 A lightly feathered Sinornithosaurus illustration. 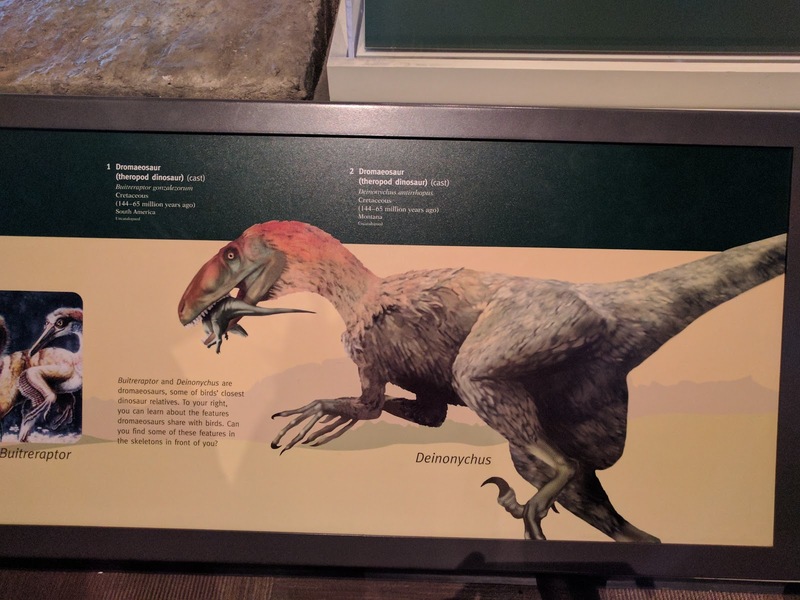 A similarly lightly feathered Deinonychus illustration. The theropods aren't the only 3-D work on display. The Parasaurolophus vocalization model is pretty great, and after visitors meet the iconic Herrerasaurus model upon entry to the dinosaur hall, they even get the chance to breeze by a big model of a plant. Hey, look! A bennettitales model! "Evolving Planet" is a great exhibit, and one I recommend to anyone visiting Chicago. Attentive visitors will definitely walk out of it with new knowledge of and appreciation for evolutionary history. Though this post may seem a bit nit-picky, it was valuable for me to visit with the intention of doing more than ogling the mounts one more time. After all, the exhibit turns 11 this year. It's reached the age of the exhibit it replaced, "Life Through Time." So it's only natural that it is starting to show its age. I think it's a good time to imagine the next form a paleontological exhibit may take at the Field. My wishlist? More on bird evolution in the dinosaur hall. And throughout, more contemporary paleoart integrated with displayed fossil specimens, more on the stories of how discoveries have been made and how they've enriched our understanding of life's history. 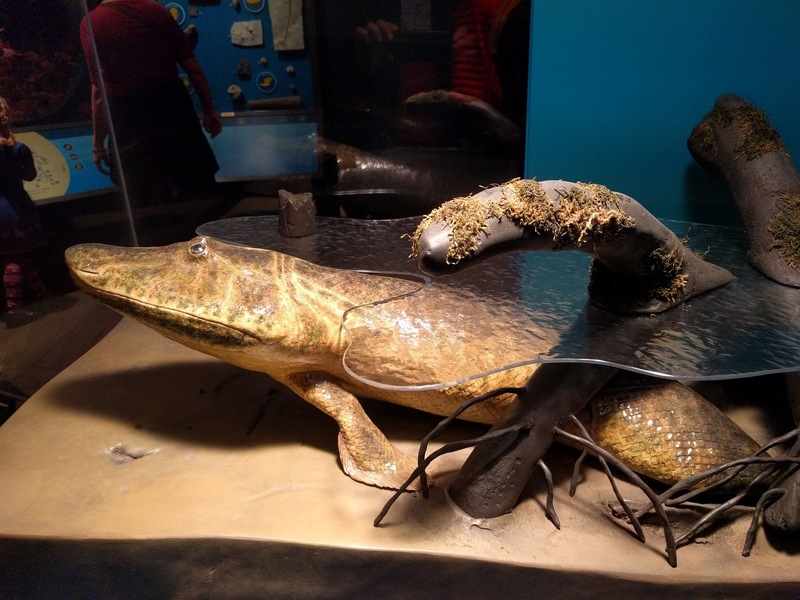 But hey, you can't complain too much when Tiktaalik is at the party. Model of Tiktaalik roseae at the Field Museum. * To see an exhibit at the Field that explicitly brings the scientific process into its narrative (see their compact-but-wonderful Lichens exhibit). Once again, we welcome Rohan Long to the blog for a guest post. Rohan is a zoology teaching guy at University of Melbourne. You can find him on Twitter @zoologyrohan and listen to his new musical project, Bronzewing, at bronzewing.bandcamp.com. You may recall his post last year almost a year ago, reviewing Crichton's The Lost World. This time, Rohan came to us with the idea of discussing the music of 1999's seminal CG documentary Walking with Dinosaurs, and we happily accepted the offer. When you start to unpack it, Walking With Dinosaurs is a strange beast; a fictional animated series earnestly presenting itself as a nature documentary. The series’ aesthetic cues are drawn foremost from the BBC school of classic documentaries – and with good reason; if the creators strayed too far from the genre as it’s traditionally presented, the spell would be broken, and the audience may well ask itself why Kenneth Branagh is playing Attenborough over a bunch of puppets and primitive CGI. Unsurprisingly, the first incarnation of the show, released in 1999, was also aesthetically and musically influenced by cultural juggernaut Jurassic Park which was released six years earlier. 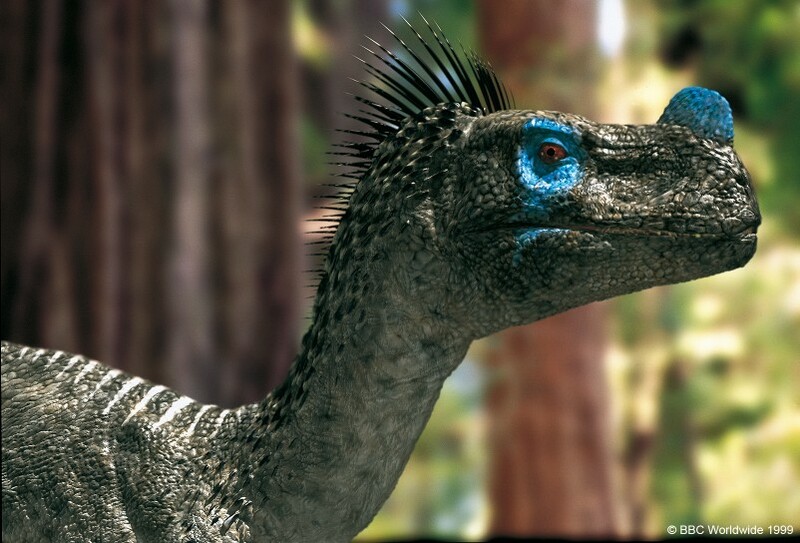 Ornitholestes from 1999's Walking With Dinosaurs. Somehow, Benjamin Bartlett avoided the obvious choice of producing a punk theme for this critter. When it comes to establishing the feel of a real nature documentary, the soundtrack must surely be one of the most crucial elements. The score by Benjamin Bartlett draws from similar stylistic touchstones to the show’s visual aesthetic – a little John Williams here, a touch of Edward William’s 1979 score to Life On Earth there. It must have been an interesting brief for a composer as most importantly, the soundtrack was required to sound like a nature documentary soundtrack. As with the overall look of the show, if the soundtrack didn’t fit the established expectations of what a nature documentary should sound like, the illusion of authenticity would be shattered. So in a sense, this soundtrack can be thought of as a work of pastiche. I bought the soundtrack CD in the early 2000s but didn’t actually listen to it until much later. Let me set the scene: I was working on a dinosaur dig with which I have a long association and was relaxing at the end of a very hard day. For the second time in as many days I had been working “in the hole” – manually extracting big chunks of rock from the fossil layer with sledge hammers and chisels so the rest of the crew could break them down, looking for fossils. That night, a combination of very strenuous work and a couple of quality Australian lagers had brought about an almost zen-like state of calm stillness in me. The crew was watching the WWD episode that features the dinosaurs from our site (because of course that’s what you’d do after looking for dinosaur fossils all day). I’d seen this episode quite a few times by this point, but this time something clicked. The music cut through to my receptive mind and I appreciated it for the first time. The music that first captivated me that evening was from the episode Spirits of the Ice Forest about the polar dinosaurs of south-eastern Australia with which I have a warm familiarity. The main motif comprises a sweeping middle-eastern section which then gives way to some icy, atmospheric textures. The follow-on track Antarctic Spring develops this theme and the incorporation of some delay-affected tuned percussion makes it sound a bit modern and cool. I think Bartlett is using a stereotypically middle-eastern sounding scale on these pieces as musical shorthand to symbolise a generic “other” – you know, because Australia is weird because it’s different to the northern hemisphere! Perhaps it would have made more sense for these themes to have incorporated elements of our actual indigenous music. It’s kind of lazy and very Eurocentric, but I enjoy the music on its own merits so I mostly forgive Bartlett for this. One thing Bartlett does very well is huge, affecting pieces that make full use of the orchestra. Islands of Green for example, uses slow-building swells of strings interspersed with steady, rhythmic bass notes and a shimmering celesta to illustrate the hardships of marine reptiles in the late Jurassic. Cruel Sea from the same episode is more stripped back but has a similar feel, this time with strings, orchestral harp and brass forming a slow, melancholy waltz. These pieces work very well as standalone songs, as opposed to tracks like say, Torosaurus Locks Horns or Canyon Of Terror which are purely dramatic tension delivery devices. I think Bartlett does a great job on this unique project, but there are weak spots. On the Time Of The Titans episode he seems to be trying to emulate the feel of William’s themes for Jurassic Park and like Williams, lapses into obvious grandiosity and unnecessary whimsy when scoring the sauropod scenes. Minor complaints aside, the soundtrack works as a very listenable album of music in addition to scoring the series very effectively. Postscript: If you’re interested in this music or soundtrack composition in general, have a read of this in-depth interview from 2000 with Bartlett on the process of composing and recording the music for WWD. As you'll no doubt recall, the last time I posted on LITC, it was to share my #cleaneating cooking tips and various photographs of myself flashing my pristinely white teeth while preparing cabbage-based dishes in a mysteriously desaturated, blandly rustic-looking netherworld. Nah, only joking - it was all about an old dinosaur book from the 1950s, written by Herbert Zim and illustrated by James Gordon Irving. Here are some more intriguing excerpts from said book, ranging from your usual Knightian hadrosaurs to a 5' 8" American. I should also point out that my teeth are far from perfect. I am British, after all. Oh, and thanks again to Charles Leon for sending me the scans! Hello LITC readers! Today we’re taking a look at All new dinosaurs and their friends from the great recent discoveries! 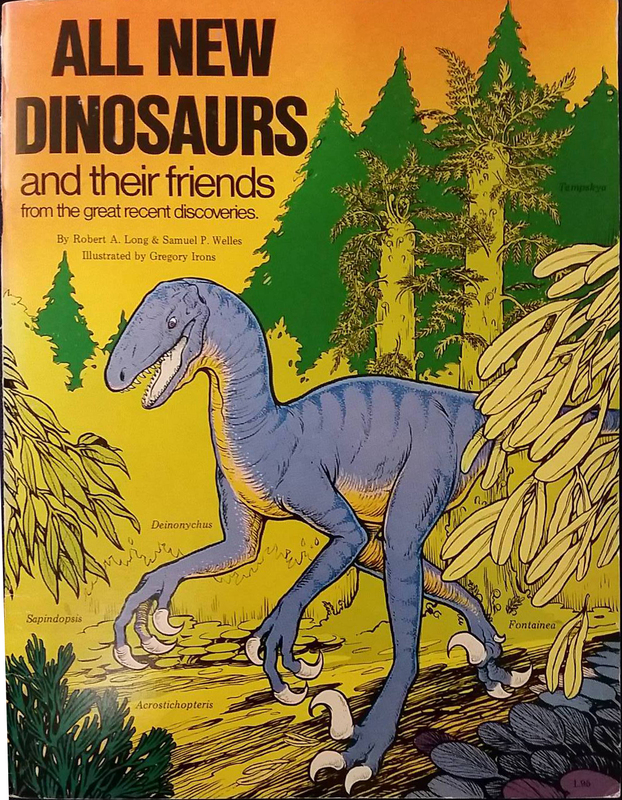 Don't let the featherless Deinonychus fool you, this is a great book with tons of personality and great art. Onwards! For those who don't know me (or happened to miss the time when I posted regularly) I'm a professional writer and journalist, who occasionally is lucky enough to write about paleontology. I'm also an artist. So last year, I approached The Bitter Southerner with a weird idea: an article that would act as a nature documentary to the vanished world of the Cretaceous deep south, with my illustrations and prose acting as a camera. The editor gave me a pretty quizzical expression, but since I'd done a lot of work for them before, he threw caution to the wind and told me to go for it. I spent the next several months researching, talking to people, and sketching, sketching, sketching. Then erasing. Then sketching some more. Then painting and cursing at the screen. All during SVP, I was hunting down paleontologists and painting in the corner of the lecture halls. Then it was time to write, and figure out how, exactly to create a nature documentary in prose. More cursing. More cursing at the screen. But after lots of blood, sweat, and tears, it's finished and published and now, finally, I can share it. So what is it? Well, picture a David Attenborough documentary, captured wholly in text and image, with its subject landscapes no human has ever seen. Imagine an article building on the ideas of Robert Bakker's Raptor Red. Imagine a narrative that leaps from animal to animal across a world poorly understood even by paleontological standards. Or hell, maybe I'd better just show you. The following is an excerpt from The Lost Continent of Appalachia. Please do enjoy it! Morning on the Alabama sea. Waves lap in under blue skies. Miles out from shore, sunlight drifts in gentle curtains through clear waters, caressing the sides of a high, jagged reef. The waters are too hot for corals; instead, walls of bivalve mollusks sit in scaffolds dozens of feet high, their shell surfaces encrusted with barnacles and long strands of algae. Marches of immense clams gape into the currents. Shoals of fish dart and swirl, chasing tiny shrimp. An octopus-like ammonite creeps from outcrop to outcrop, tentacles probing, stalk eyes bulging, its coiled shell shining in brilliant colors. A muffled chorus of clicks, squeaks, and croaks echoes along the reef. Diving into these waters as a human would be like slipping into a warm bath. Even this far from the equator, seawater temperatures hover at a year-round average of 90 degrees or higher. Hot oceans lead to low currents and frequently stagnant waters — the lower reaches of the inland sea suffer frequent drops in oxygen, fueling vast dead zones. Fueled by the heat, massive hurricanes sweep along the coasts, churning up the bottom and carrying tracts of organic material out to sea. But the turbulent ocean supports riches, too: The combination of shallow waters, abundant sunlight, and upwelling nutrients feed a variety of monsters. An immense shadow slides over the mollusk reef. The fish panic, contracting into mirrored walls or exploding into dizzying clouds. With a squirt of sea water, the ammonite pulls inside its shell. Sculling overhead is a 40-foot Tylosaurus, her flippers tucked against her sides, keeled tail moving in slow, sinuous strokes. She’s a mosasaur, a descendant of small monitor lizards that colonized the sea in the earliest Cretaceous. As competing families vanished or turned to specialized fish-eating, the mosasaurs exploded in size and colonized every ocean in the world. 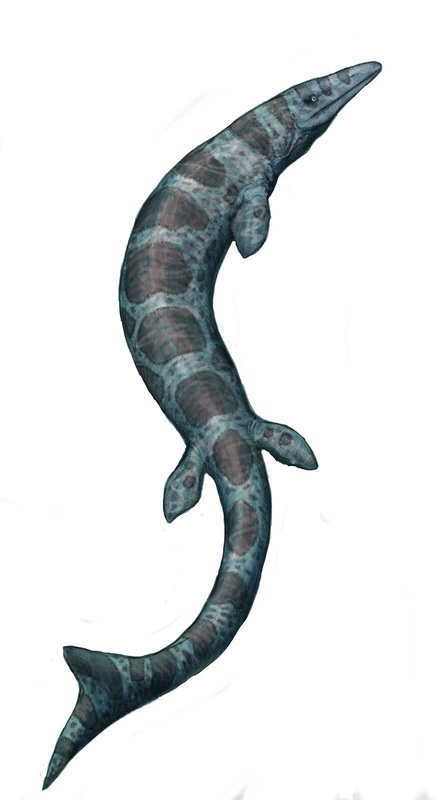 The waters of Alabama alone play host to the portly, clam-crushing Globidens, the swift Platecarpus, shy Clidastes, and Tylosaurus, ruler of them all. This mosasaur is formidable, with long, heavy jaws and a crushing bite. She moves through the water with the lazy assurance of an apex predator. Years ago, she claimed a stretch of the surrounding sea with access to both deep water and high reefs, and now she knows it by heart: the best spots to settle in for a nap, where the cleaner fish gather to nibble at parasites and flakes of dead scales, and most importantly the spots where she can lurk undetected, waiting to seize anything — fish, diving bird, or smaller sea-lizard — outlined against the surface. Her black eyes scan the riot of colors. Most of the time she guards her territory jealously. But once a year, she makes an exception — for her mate. He’s coming now: a 46-foot titan, his scarred, barnacle-encrusted head swiveling. A broad tongue laps out, checking her scent trail, trying to assess whether she’s receptive. She circles around, investigating him in turn. She knows him well: Like her distant kin, the modern Komodo dragon, Tylosaurus sometimes form loose but long-lasting relationships, splitting for much of the year before coming together in the breeding season. Despite their familiarity, both are cautious. Mosasaur courtship can swing from tender to violent in a heartbeat, and both bear literal scars from past failed romances. A reintroduction is called for. Want more? Check out The Lost Continent of Appalachia over at the Bitter Southerner. I'll be posting bonus content--including some deleted scenes and art that didn't make the final cut--here in a few days. Keep an eye out! Long-time readers may remember that five years or so ago, I created a collection of dinosaur family crests. They proved to be a decent seller in my shop. Eventually, I decided to retire them, along with some other design collections, to keep the designs in my shop more current. But I always intended to revisit the idea, and now I am. 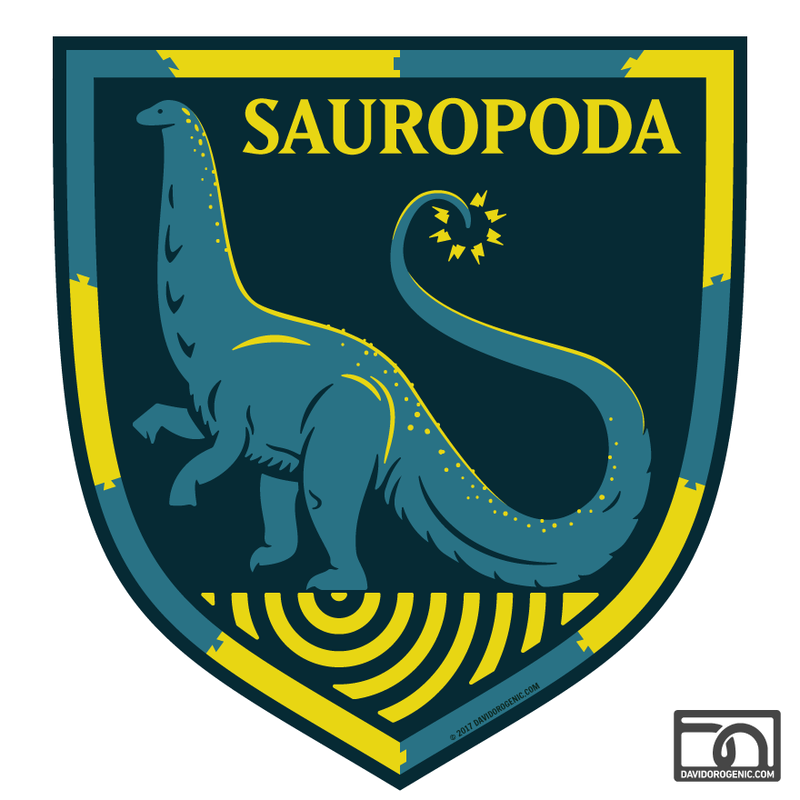 The first of the new line is dedicated to the great thunder beasts of Sauropoda, featuring Brontosaurus rampant. It's available in my shop on a wide variety of merch. Purchases are always appreciated, of course, but at this time they'll be especially helpful in our efforts to move to WordPress. I'm pretty happy with how it turned out and look forward to filling up the collection. I've begun figuring out Thyreophora, and after that will likely be Ornithopoda. And I suppose Theropoda will be coming down the pike. Stinkin' theropods. They'll be added to the collection at Redbubble, which can be accessed by this direct link. One last thing: I would be remiss not to mention that Rebecca Groom does some absolutely delightful heraldic designs, including her Yi qi, currently available. Living on an island devoid of giant theropods, Hatzegopteryx was an azhdarchid pterosaur that acheived a status few of its brethren could hope for: top terrestrial predator. Read more about this "shoebill-hornbill-terminator" from Mark Witton and Brian Switek. This year's edition of PaleoFest, held at the Burpee Museum of Natural History in Rockford, IL is coming up in one month. Head to the museum's site to download the registration form. LITC's own Victoria Arbour will be speaking there! And I *miiiiiight* be able to go. One of the more obscure casualties of the Permian-Triassic "Great Dying" was the mysterious hyolith. Now, it's been given a place on the great tree of life: as a member of Lophophora, along with the relatively more famous brachiopods. 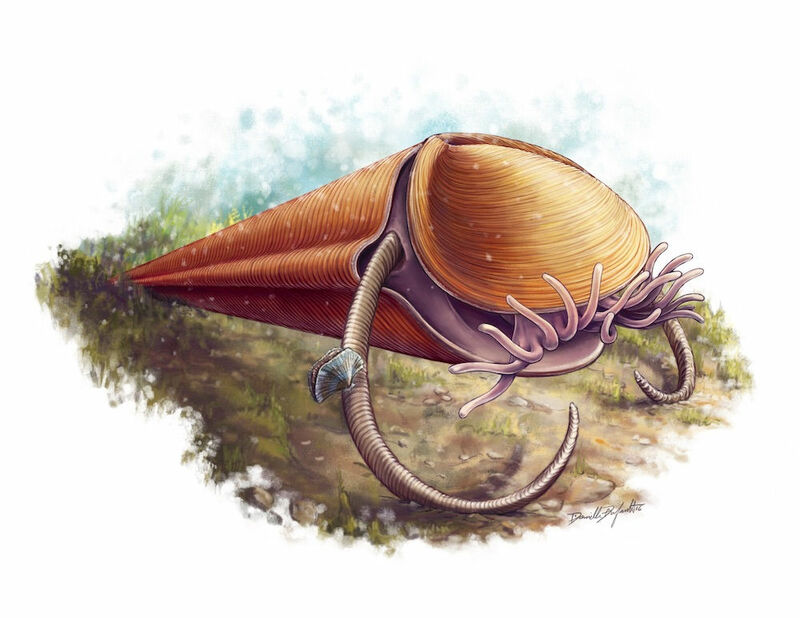 Read more about the "tentacled ice cream cone" from Everything Dinosaur and NPR, Live Science, and the NYT. Danielle Dufault's illustration, above, is another wonderful example of how a good piece of paleoart makes the alien approachable. It got pretty darned cold after the Chicxulub impact. Fernanda Castano writes about new research modeling the post-KT global climate. The US state of Arkansas is one step closer to naming its own state dinosaur, the undescribed coeleruosaur foot known as "Arkansaurus." For her part, Rebecca Hunt-Foster, who initially examined the fossils in the early 2000's, is working on getting the critter described. Check out that link to see loveable rouser of rabble Brian Engh's illustration, too. How long did non-avian dinosaurs incubate? 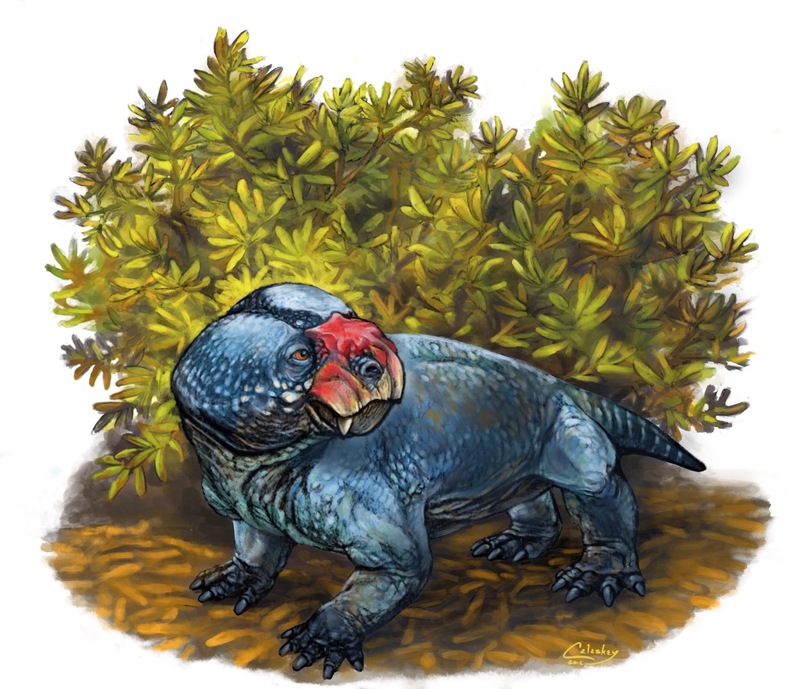 New research looks into the question by studying growth lines in the teeth of Protoceratops and Hypacrosaurus embryos, among other methods. Their conclusion is that it's likely that the rapid incubation we see in living dinosaurs is a later development, and most Mesozoic dinosaurs developed slowly. Read more from Carolyn Gramling for Science and NPR. At Aeon, Alex Riley writes about recent efforts to understand what prehistoric worlds sounded like, touching on Vegavis, Parasaurolophus, and the bush cricket Archaboilus musicus. At SV-POW, Mike Taylor cautions us not to rely on a photo to interpret a fossil. Rebor has released three Deinonychus replicas as part of a larger Acrocanthosaurus and Tenontosaurus diorama, and they are quite lovely. Check out Everything Dinosaur's post on the set. Now, I look forward to the alternate universe version, in which a Tenontosaurus triumphantly bellows a victory song atop a heap of fallen theropods it has bested. Lisa Buckley, inspired by some proselytizing door-knockers, decided to start making science-oriented pamphlets to hand out when the need arises, starting her "Science Tracks" series with OMFG Birds are Great! How does one keep up with the ever-increasing amount of paleontological research? At the SVP blog, Dr. Darin Croft has some advice. 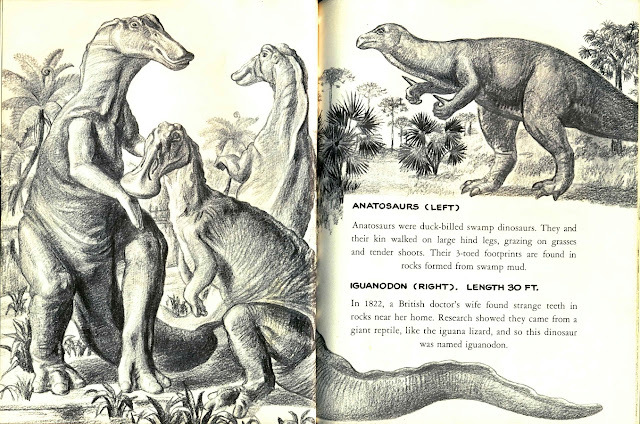 At Quartz India, Pranay Lal writes about the dinosaurs of Cretaceous greater India. At Paleo-King, Nima brings our attention to an article from 2015 that reports the results of a paleoart survey of 115 paleontologists (of whom 100 responded). The article, published in Current Trends in Paleontology and Evolution, had the goal of creating a working definition of paleoart. One question was for respondents to identify paleoartists whose work they recognized, with interesting results (Doug Henderson and Greg Paul each had only 5 mentions apiece). It would be interesting to see this performed with a larger sample size and with more international participation: Spain accounted for 70% of the respondents. Direct PDF link here. Sometimes a fossil in prep confounds one's expectations: so writes Anthony Maltese about a spectacular, unexpected Ichthyornis fossil he's currently working on. If you're into turtles and you're into latitudinal diversity gradients, Jon Tennant has you covered, sweetheart. 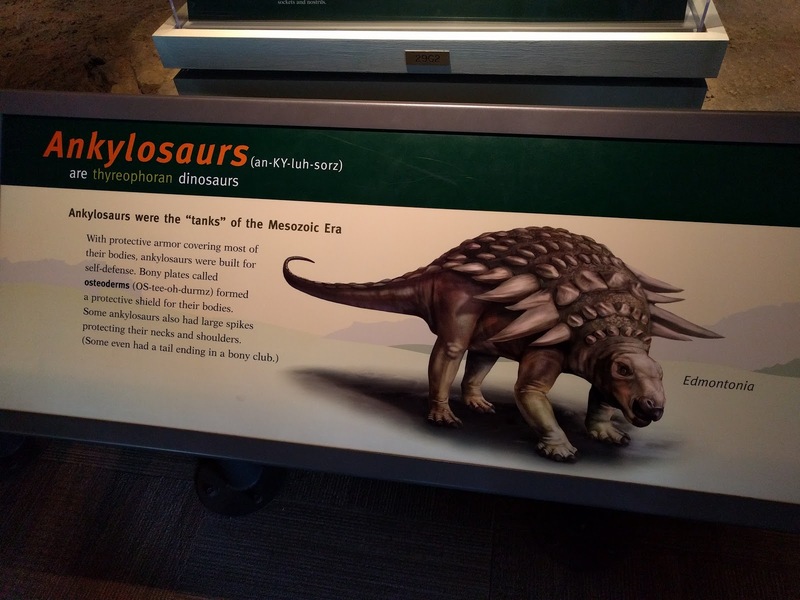 Susie Maidment ran through hypotheses about the function of stegosaurian plates and spikes for the website Know it Wall. Duane Nash wades into the great feathers vs. scales fracas at Antediluvian Salad. 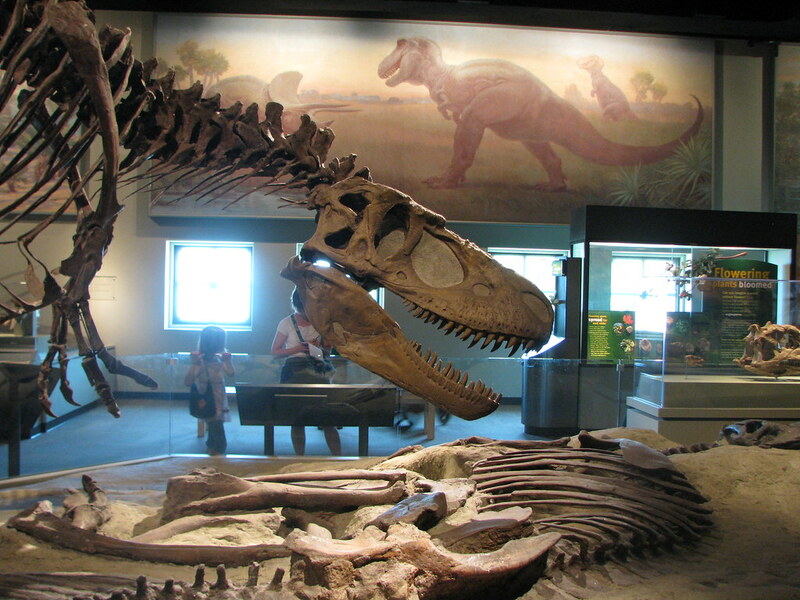 We'll end with a little field trip to Mongolia, starting at Extinct, where Leonard Finkelman writes a metaphysical musing on the "ownership" of fossils, stemming from the debate over repatriating fossils from the American Museum of Natural History back to Mongolia. Also read the statment from Bolortsetseg Minjin, president of the Institute for the Study of Mongolian Dinosaurs, on the complicated matter. She also spoke to Palaeocast about it last year. While we're on the topic, head over to Prehistoric Beast of the Week and check out Chris DiPiazza's recent post featuring great illustrations of Mongolian dinosaurs.. Plenty going on this month! If you're not able to donate to these campaigns, help spread the word. It really does help, and folks running campaigns do appreciate every share. A couple of campaigns are closing soon at Experiment, a science crowdfunding site. First is The end of an Era: Resolving the dinosaur extinction and the beginning of the 'age of mammals' in northwest Argentina. Ending in less than a week, a University College London team led by Anjali Goswami and Agustin Scanferla "will intensively explore new fossil sites in Northwest Argentina, where we have recently discovered dinosaur, crocodile, and other fossils from this period." Next up is Geology of the Upper Jurassic Morrison Formation of central Montana. A team from the University of Oklahoma led by Dean R. Richmond hopes to "describe the stratigraphy, sedimentology, and depositional facies of the Morrison Formation in central Montana." The crowdfunding effort will help cover the costs of analyzing a wealth of material that was collected in quarries last summer, including sauropod fossils, petrified wood, and freshwater and marine organisms. Artists Raven Amos and Scott Elyard, who run the excellent art and design firm Cubelight Graphics, are holding their ninth art show soon, taking place at Espresso Cafe in Wasilla, AK. They've held a successful Indiegogo campaign to fund printing of their art for the show, but it's still worth chipping in to help meet stretch goals - as well as to get some great perks, natch. So, I'll be sharing one of Raven's featured pieces, the wonderful Styracosarus Jungle. I'm not alone in my love for Raven's work, which often hearkens back to pop art and art deco. 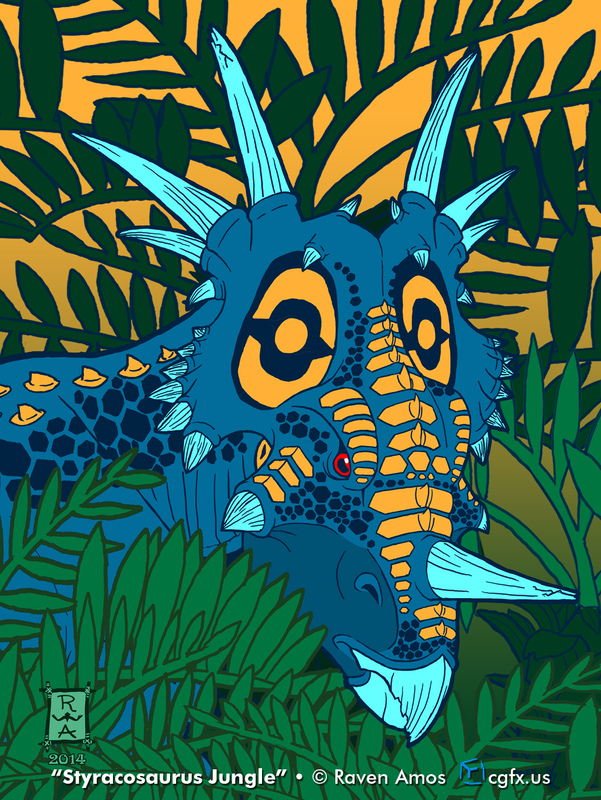 Styracosaurus Jungle, © Raven Amos. Shared with the artist's permission. Also check out the promotional video for the show shared below. Congratulations on the successful campaign and best of luck at the show, Raven and Scott!